In what is hopefully not the shape of things to come for race coverage the weeks world tour race, the Tour de Romandie was shown in an ‘exclusively live’ stylee by Sky. As we don’t move in those kinda circles at VCSE Towers, more of that later as we talk about the racing we could watch; the cat 2.1 Tour of Turkey. This was an interesting race for all kinds of reasons. The field was predominantly pro continental with a sprinkling of world tour teams plus the Turkish continental Torku squad. For the world tour it was a sprinters outing with Marcel Kittel and Andre Greipel the stand out names in a quality field with six sprint stages out of eight. Geographically it was probably a reasonably safe bet that the race would be held in good weather and other than contending with cross and / or head winds on some days the peloton enjoyed its first race of 2013 that hasn’t involved arm warmers, rain jerseys and overshoes. The race has been held for nearly 50 years but has only reached 2.1HC status in the last couple of years. As such it’s what is known as a ‘flyaway’ race and the teams leave their buses, trailers and team cars behind with all transportation provided by the organisers. Any regular viewers will know that the default team car of the world tour is the Skoda Superb estate. There are a couple of exceptions with moneybags outfits like BMC and Sky opting for Mercedes and Jaguar but whatever difference these cars have in price they share the common feature of taking up lots of road. Skoda like to make a virtue of this by recreating a series of crashes, scrapes and near misses shot from ‘inside a team car’ for their advertising. No ‘fly on the wall’ was available when the respective DS’s of Argos Shimano and Omega Pharma et al picked up their team cars but there were probably some jaws dropping when they realised that they were going to have to use a Renault Clio. Conspiracy theorists may speculate this is why BMC and Sky didn’t show. The stages went sprint, sprint, summit, sprint, sprint, summit, sprint, sprint. First blood went to Kittel before stage two served up the kind of finish that ensures the memories of the Tour of Turkey will live on via YouTube long after people have forgotten minor details like who took the overall. With another sprint finish in the offing Blanco were leading with Mark Renshaw looking to deliver Theo Bos for the win. Finishing in Antalya the surrounding hotels and apartment blocks required a helicopter tracking shot for the final few k’s. Dissection of what happened next suggested that Renshaw touched a wheel, but whatever the cause the outcome was possibly the biggest pile up ever. Riders that weren’t involved in the crash (the minority) came to a halt as there was no way past a tangle of bikes and riders that spanned the road. Orica’s Aidis Kruopis celebrated as if he had actually beaten Greipel and Kittel by inches and saying in his post race interview that ‘..I felt I could pull off a result today’ suggested he should starting gambling or astrology as he could be equally gifted at both. Stage 3 saw the first summit finish of the week and another notable first as Europcar’s NatnaelBerhane became the first African to win an HC category event. Berhane took over the GC from Griepel, with his classy win showing great tactical awareness, attacking at the last when his rivals ran out of legs. Berhane showed more flashes of brilliance later in the week when he was able to bridge back to the leading group to safeguard his leaders jersey. He seemed like a pretty safe bet for the overall but there was another twist in the tale on stage 6. If you’re a Turkish team it’s a pretty safe bet that you will get an invite to your ‘home’ race. Torku had been in the mix all week holding the Mountains jersey and getting riders in the breaks. One of the riders in the group that Berhane emerged from on the climb to Elmali was Torku’s Mustafa Sayar. He drew attention on the climbs thanks to his ability to churn out a gear that looked at least two cogs smaller than anyone else. Susceptible to attack and changes of pace, despite all this Sayar kept grinding the big ring crossing the line 6 seconds down on Berhane. Sayar, distinctive in the peloton if not for his pedalling style than his hairstyle with what can only be described as a mullet was pushing another massive gear on stage 6. The difference here was that as Sayar ground up the climb the remaining GC contenders, Berhane included couldn’t stay with him. Sayar had 18 seconds on the next best rider on the stage and took 43 seconds out of Berhane to take over the lead. There was some talk afterwards and the day after in a ‘come from nowhere’ context as some people questioned the validity of Sayar’s win. Another one for the conspiracy theorists perhaps, but a look at Sayar’s results so far this year suggest he is in the form of his life even if not at this kind of level before. With no more significant climbing involved Torku defended the GC over the next two days onto the finish. Attention shifted back to the sprinters. Andre Greipel had taken stages 4 and 5 convincingly thanks to his ability to get over the climbs on the hilly stages better than Kittel. With the topography favouring Kittel on the penultimate stage 7 the riders would enter the last day on two stage wins apiece. Many of the stages followed the same route as previous years and just as stage 2 had served up 2013’s YouTube sensation the finish in Izmir provided the fun in 2012 as you can see in the clip below. This years stage was not without its talking points. The dozen or so riders who took the wrong line as the race entered the final few kilometres, including most of the Orica lead out train, found that they couldn’t rejoin the race after heading up a virtual cul-de-sac. Stage 8 was raced across two continents as an event held in Istanbul only can be. A minor spill involving one of Greipel’s Lotto team mates on the run in may have hampered his lead out as he was a few bike lengths behind Kittel as the race got within 500M of the flag. 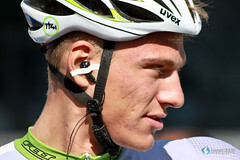 Kittel, blocked slightly himself extricated and won easily. The last kilometres of the stage had been run around a 12k circuit which led to the odd backdrop of an avenue of white vans provided by the organisers in lieu of the teams normal buses parked on either side after the finish. The Tour of Turkey proved to be a worthy alternative for Eurosport this week. Magnus Backstedt co commentated with David Harmon and rode a number of the stages in full or part which provided another level of insight. Big Maggi is often the one who gives the game away about how many races Eurosport cover from the UK as he invariably pops up on social media miles away from the race he is commentating on. The racing this week has definitely benefited from having Eurosport ‘boots on the ground’ as Maggi and David Harmon were able to share conversations had with the riders and support staff first hand and post on bike footage of each stage. Rather like the Tour of the Basque Country earlier the Tour of Turkey served up an unexpected and entertaining week of pro cycling. Can’t tell you much about this one as VCSE couldn’t watch it. It’s interesting to see that Sky have picked up a couple of the races that ‘their’ team won in 2013 with the Tour de Suisse to be shown later in the year. The fact that both races are held in Switzerland may be of more significance but without the premium digital TV subscription VCSE has been reliant on social media to catch up on the Sky blitzkrieg in the Alps. With Sky announcing the Giro squad this week the riders supporting Chris Froome at Romandie are more than likely some if not all of the Tour team including Richie Porte, Vasil Kireyenka and David Lopez. Froome is a pretty decent time trialler so the stages book ended by a prologue and time trial looked made for him to retain the title that Bradley Wiggins took in 2012 for Sky. The opposite weather to Turkey prevailed with the penultimate stage curtailed due to the conditions. It sounds like Sky employed the usual tactics of controlling the pace although this must have been touch and go until the penultimate stage with Froome enjoying only a 6 second advantage over Garmin’s Andrew Talansky. Talansky slipped off the radar at this point finishing well down the GC. Conclusions from a race we didn’t watch? After winning the race last year its hard to imagine Sky would have lined up with any other plan than to retain the title. The psychological impact of leading and winning a race that involves a yellow jersey seems hard to resist and when there has been one up for grabs in 2013 it has generally been a Sky rider who’s wearing it. Another parallel is that Froome like Wiggins before him is winning most if not all of the races he enters. Other than Tirreno Adriatico where the steeper punchier climbs don’t favour him or Sky’s tactical approach Froome has looked good (we’re assuming he looked good at Romandie, this was certainly the case in Oman and the Criterium International). Does this mean Froome and Sky will with the Tour? Let’s assume that Bradley Wiggins won’t win the Giro. If this is looking likely before the start of the final week in Italy Sky could hold back one or two of the Giro squad, Henao, Siutsou, Uran or even Wiggins himself with a view to bringing the strongest possible team to the Tour. If Wiggins is still in the mix for the Maglia Rosa at the end of the Giro VCSE thinks it’s possible that Sky might be spread to thin to have a tilt at both grand tours. The Giro squad looks light, although the make up is partly driven by the teams part Italian ownership. So far all of the talk emanating from the Death Star has been that Wiggins is in better shape than at this point last year. Race results suggest otherwise however and Sky said similar things about their classics squad this year. As things stand the VCSE tenner would be going on Froome for the Tour at this stage. Next Next post: Someone to boss Vos?